NewsRoom RSS Reader: After months of searching fruitlessly for a decent RSS reader for Android, I finally stumbled upon NewsRoom last month. Wow, what a life-changer. It has become my primary RSS reader largely taking over for Bloglines on my PC (which is an app desperately in need of a makeover). NewsRoom’s slick interface is the most friendly finger-swiping app I’ve ever touched. I can quickly flip (left and right) through headlines for each feed and then easily pull up full text of any particular post with a quick flip of the thumb up. The only downside is the limited number of feeds you can have on the main pages. But that actually helped me go back and sort through my feeds to determine which ones I needed to be reading on a daily basis vs those that I can just monitor every couple days or weekly via my PC. I love this app. TweetDeck (v.34): I have no idea how the folks at TweetDeck make any money, but they produce one the most spectacular pieces of freeware on the planet. It makes Twittering a real joy by making it a cinch to follow multiple hashtag topics in addition to your primary friends and mentions. And reTweeting is super simple. And version 32 just raises the bar even higher with new features like scheduled Tweets, maps, Buzz and Foresquare integration, and much more. I would gladly pay a few bucks a month for TweetDeck, but this amazing app remains free to the public. Apparently they are booking revenue, but I can’t figure out how. (Seriously, how do they do it?!) Regardless, keep up the great work guys… and hurry up and get the Android version out! I played with TweetDeck for the iPhone and it is outstanding. I’m pretty happy with TwiDroid, but I think I’d prefer TweetDeck for my Droid. Stardock Fences for Windows: I am a huge Windows 7 fan as it offers me just about everything I’ve ever wanted in an OS. 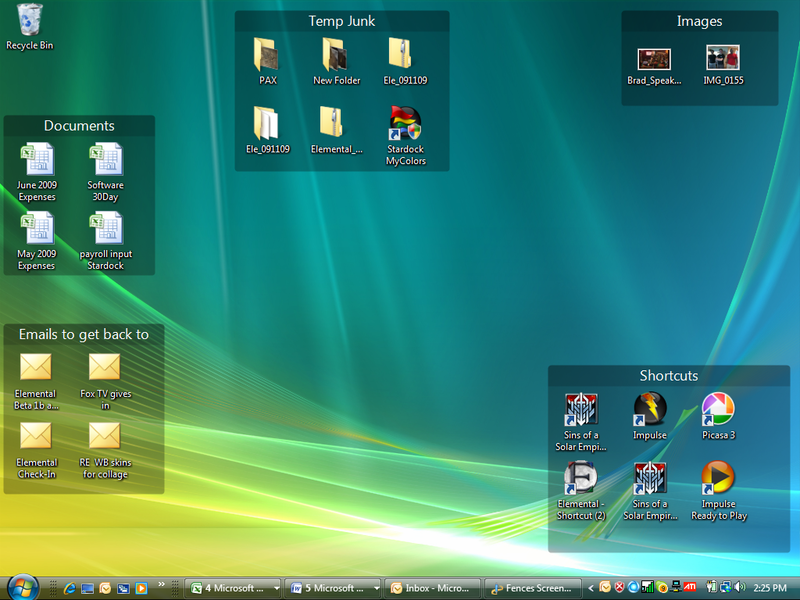 However, I’ve remained mystified by the lack an icon “grouping” capability on the Windows desktop. I know you can always created folders and throw programs in there, but why no ability to group the icons for specific programs into a “pen” that could be easily moved around on the desktop? Well, someone finally did it. Stardock (the folks who make some amazing (but memory-intensive) “deskscape” desktop skins) have created “Fences” for Windows, and God bless em for it. Fences allow you to easily create groups for specific icons, programs, documents, shortcuts, etc. And you can scale them however you wish and place them wherever you want. Better yet, to create a new “fence” of any shape or size, just by right-clicking on your mouse, holding it down, and then drawing the outline of your new group and it will instantly pop up. It works perfectly. There’s also a ghosting feature that allows you to change the opacity of any one fence, or hide it entirely unless you hover over it. You can also double-click anywhere on the desktop and it wipes the slate clean of any icons momentarily. “Fences” is a great little program that helped tidy up my desktop the way I have always wanted. Toy Soldiers for XBox: Is it a bad thing for a 41-year old man to be hopelessly addicted to a video game? Well that’s me right now with “Toy Soldiers” for the XBox 360. I am a sucker for just about any “tower defense” game (“Defense Grid” is another obsession, but it’s too easy). Toy Soldiers, however, has revolutionized the tower defense genre by combining a bit of history (World War I battlefields and units) with a unique form of gameplay that puts you more fully in command of the individual towers, as opposed to typical “place and pray” model of other tower defense games. By allowing the user to take control of artillery, machine guns, chemical weapons, sniper rifles, mortars, anti-aircraft guns, bombers and bi-planes, and so on, Toy Soldiers allows the user to play almost any role they want in the battle. (I love the guided artillery cam!) The battlefields are spectacular, although a bit constrained. You are only allowed to place units in pre-selected spots, and some of the maps are a bit small in scale. (I’m still waiting for some new downloadable battlefields, but none have yet been offered by Microsoft.) Regardless, this game is an absolute masterpiece and I can’t put it down, even after completing all the battles on multiple skill levels. Pathetically, I check nightly to make sure I haven’t fallen out of the top 100 players in the world. Yes, I play that much! So, a big THANK YOU to all these companies for making my life better, more productive, and enjoyable!